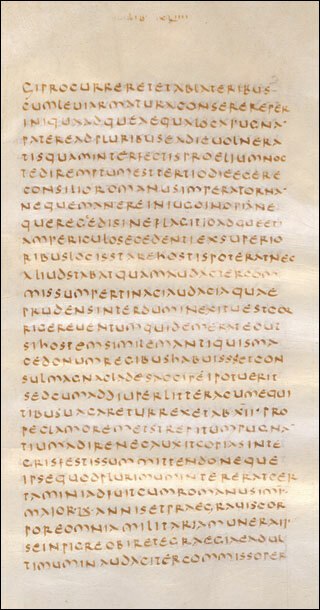 The manuscript contains the books 41-45 (with gaps) by Livy, which are the only surviving copies. According to the entry on fol. 193v (... [b? ]erti ep[iscop]i dedorostat) (Wijk bij Duurstede nahe Utrecht), at the end of the 8th or the beginning of the 9th century the manuscript was in the possession of a Bishop of Utrecht. In 1527 Simon Grynaeus discovered the manuscript in the monastic library of Lorsch. As a result, in 1531 he published the first edition of the half 5th decade of the Augustan historiographer in Basel, with an introduction by Erasmus of Rotterdam. The manuscript was taken from the collection of books at the Ambras Castle near Innsbruck and brought to the Imperial Court Library in Vienna.